A good example of a Neolithic long barrow with the mound still intact and surrounded by a stone wall. The chamber tombs, where the remains of 31 people were found, have been opened up so visitors can see. Belas Knap long barrow has a trapezoid mound, rather unusually orientated north-south, with a drystone retaining wall. At the northern end of the mound is the forecourt, which consists of a recess flanked by two 'horns', or projections of the mound. This is fronted by the false entrance of two standing stones and a lintel stone. The remains of a well preserved Roman Villa set in a peaceful wooded Cotswold Combe. Thirty-two rooms including 2 complete bath suites. Visitor centre and museum. Fine 4thC mosaics. Lots of events throughout the year. Please check the National Trust website for more details. A chance to see Roman Britain at its grandest and imagine life in the 3rd and 4th century. Built in the 13th century by the Duke of Cornwall, the beautiful ruins of the once wealthy Hailes Abbey are set amid delightful Cotswold countryside. The serene and peaceful atmosphere makes it the perfect spot for a picnic. Let the excellent audio tour and new interpretation panels bring the story of Hailes to life and discover how a phial, allegedly of Christ's own blood, attracted pilgrims from far and wide. The enigmatic Old Baptist Chapel - one of Tewkesbury's most important historic buildings - is now being managed by the Abbey Lawn Trust through the John Moore Museum. The Chapel is believed to one of the oldest of its types in the country and is of great significance and importance to the local area. You can visit the Chapel Tuesday - Saturday, all year round; by arrangement with the John Moore Museum (separate admission charge applies). Snowshill is no ordinary manor, as Charles Paget Wade was no ordinary Edwardian gentleman. Mr Wade embodied his family motto 'Let nothing perish', spending his life and inherited wealth amassing a spectacular collection of everyday and extraordinary objects. He bought each because of its colour, craftsmanship and design, restoring the ancient Cotswold manor house to display them. Laid out theatrically, the Manor is literally packed to the rafters with 22,000 or so unusual objects - from tiny toys to splendid suits of Samurai armour. The Manor is surrounded by an intriguing terraced hillside garden designed in the Arts and Crafts style. Superb Norman abbey with 14th century vaulting and windows. Largest surviving Norman tower in the country. Formerly a Benedictine monastery, Tewkesbury Abbey is larger than many cathedrals. Features include the exquisitely sculptured tombs and chantry chapels, 17thC Milton Organ and some of the finest roof bosses in England. A museum of the local history and daily life of Tewkesbury, exhibited in a splendid Tudor house. Collections range from early Roman and the Battle of Tewkesbury to Antarctic exploration and there traditional Mop Fair. Open all year round. Chavenage has an unspoilt aspect since its reconstruction in 1576, with 17th century tapestries and a collection of stained glass windows. Tours conducted by owner or his family who tell stories of ghosts and the families who have lived at Chavenage over the last 500 years. Also grounds set amid the Cotswold countryside. Has been used as location for several television productions. 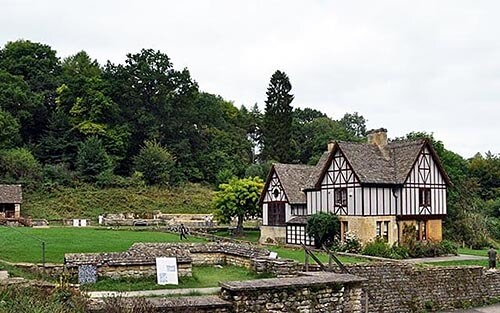 Leave the 21st century behind you and discover the treasures of the Cotswolds as you explore its history at this award winning Museum. The country home of William Morris - poet, craftsman and socialist - from 1871 until 1896, this Grade 1 listed Tudor farmhouse lies adjacent to the River Thames. Possibly the most evocative of all the houses associated with Morris, Kelmscott Manor contains an outstanding collection of the possessions and work of Morris, his family and associates, including furniture, textiles and ceramics. A Cotswold Arts and Crafts house, one of the last great country houses built in the traditional way and containing beautiful furniture, ironwork, china and needlework specially made for the house. The large garden complements the house and contains many areas of great beauty and character including the magnificent herbaceous borders, topiary, roses, alpines and kitchen garden.